Am Mòd Nàiseanta Rìoghail (The Royal National Mòd) in action. Singers, speakers and musicians in Gaeldom will be cramming words and music for The Royal National Mòd in Dunoon that begins one month today. Am Mòd Nàiseanta Rìoghail (The Royal National Mòd) returns to Argyll next month, running from October 12-20, with a special focus on Scotland’s Year of Young People 2018. The nine-day festival of Gaelic music, arts and sport will feature a host of initiatives aimed at encouraging more young people to get involved. 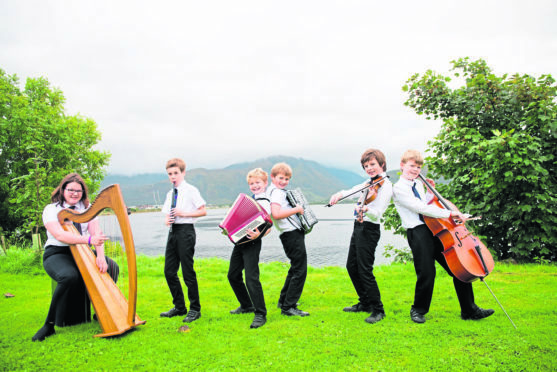 Throughout the year, Dunoon schools have welcomed tutors from Fèis Sgoil to help them prepare for Mòd competitions, as part of An Comunn Gàidhealach’s Mòd Academy initiative, which aims to help youngsters learn and develop their musical and Gaelic skills. Organisers have been working closely with the Camanachd Association to arrange a junior shinty Mòd Cup match before the annual senior match. This year also saw the establishment of a young person’s committee, supported by the Year of Young People 2018 Event Fund, which has allowed young Gaels the opportunity to get involved in the Mòd planning process, and to have their say on what they would like to see. Last year’s event in Fort William generated £2.6 million for host location Lochaber and organisers are confident they will see a similar impact in Dunoon. The newly refurbished Queen’s Hall will play host to several key events at Scotland’s biggest Gaelic Cultural Festival, which will kick off on Friday, October 12. The annual torchlight procession will open the celebrations in style with hundreds of people weaving through the streets of Dunoon. The procession will conclude at Queen’s Hall, where the opening ceremony will take place. Alongside the main competitions, The Mòd Fringe returns with a jam-packed programme filled with foraging, shinty, orienteering, traditional music, book launches, ceilidhs, concerts and art forms of every description, throughout the festival week. John Morrison, chief executive of An Comunn Gàidhealach, said: “At the Royal National Mòd, we aim to promote and celebrate Scotland’s unique Gaelic cultural heritage. It’s been fantastic to get Scotland’s young people involved in a much more profound way this year, and it’s promising to know the future of this heritage is in such capable, enthusiastic hands.